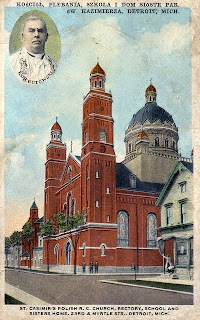 St. Casimir was the first Polish parish on the west side of the city of Detroit. St. Casimir had an elementary school with 190 students registered in 1985. A temporary church was built first, then a school with appropriate homes for the clergy and teachers. In 1889 the parish church, modeled after St. Peter in Rome, was begun and finished in 1890 at a cost of $126,000. The parish closed in 1989. The current church building is now an African-American church. It's a new bldg. The original was torn down many years ago for safety reasons. The second church building had an exact twin in Chicago... the Polish church of St. Mary of Perpetual Help. The Golden Jubilee book of St. Casimir Parish, 1882-1932 has been cataloged and is searchable on the PGSA web site. The web site, SaintCasimir.com has a tremendous amount of information about this historical church and school. It's without a doubt the best historical church web site I've ever seen... yearbooks, photos, and more! The Polish Roman Catholic Churches of Metropolitan Detroit by PERC, c. 1985. Used with permission from Michael Krolewski, editor.